Around 520 million years ago the sandy beaches that would become Potsdam sandstone were laid down as marine waters began to encroach upon the continent. As the waters continued to move towards the northwest, these beaches were submerged and then slowly covered by sediment that settled out of the sea. This sediment would eventually become thousands of feet of stone (called dolomite), which would later erode, exposing the sandstone below. It was Sir John Johnson (a loyalist leader during the American Revolution) who first took notice of the stone and its potential as a building material. This was while he followed the Racquette River through Hannawa Falls, on his way to Montreal, as he fled colonial forces sent for his arrest in 1776. However, it would not be until after 1809, with the establishment of the Parmeter quarry south of the Village of Potsdam, that this often colorful stone would be put to use in construction. A more in depth history of Potsdam sandstone by Jim Carl is available at downloads on the left of your screen. DESCRIPTION: Potsdam's first sandstone building, constructed in coursed rows. It was built for Liberty Knowles and Sewall Raymond by stone mason Anthony Furness as an experiment to see if the stone was a viable construction material. It was originally used as Raymond's general store. DESCRIPTION: Surveyor John M. Call built the first residence in the village of Potsdam using sandstone in coursed rows. 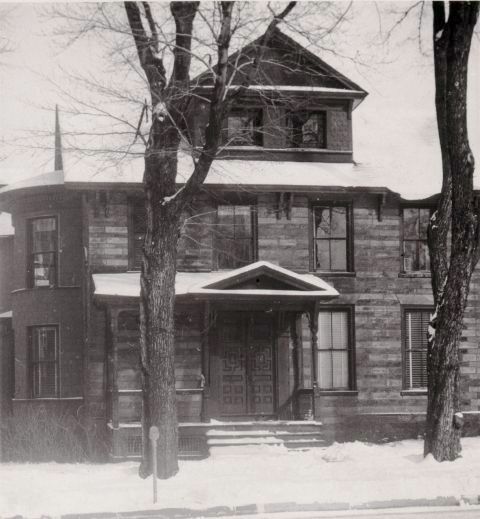 The house was purchased by Bloomfield Usher in 1854 and during his ownership the Victorian porches were added. It became the Potsdam Club in 1895. 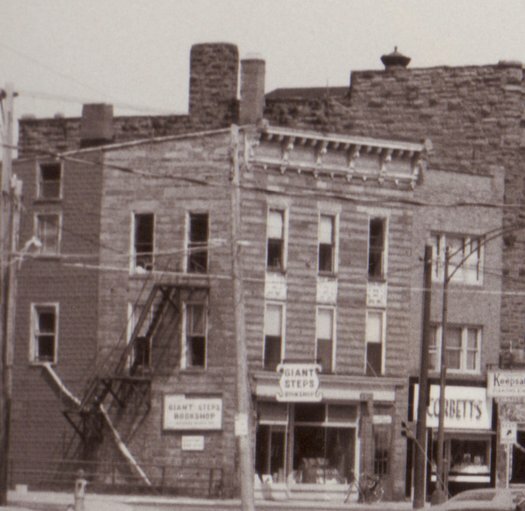 In 1960, the building was sold to the Potsdam Elks Club. DESCRIPTION: Luke Brown House is a historic home located at Parishville in St. Lawrence County, New York. It was built in 1823 and is a two story, five by three bay, side gabled Federal style residence constructed of red Potsdam Sandstone. 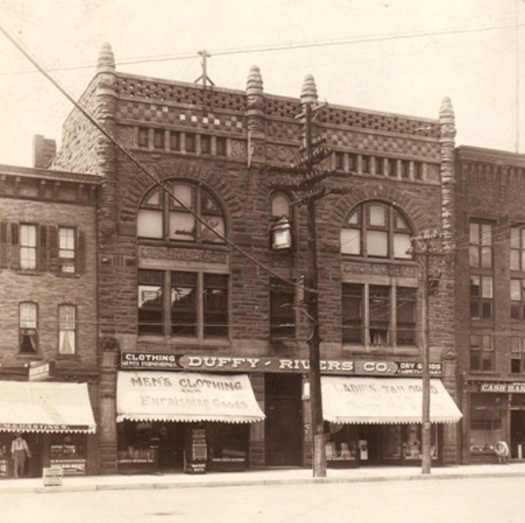 It was listed on the National Register of Historic Places in 2003. DESCRIPTION: Built by Augustus L. Clarkson. 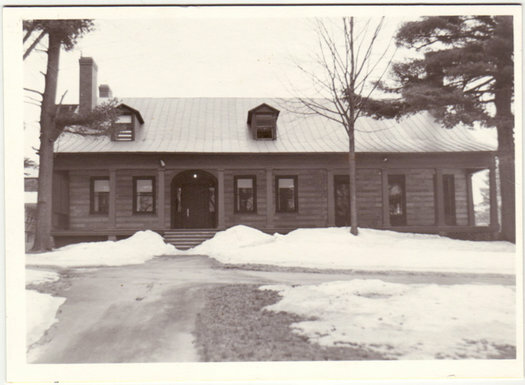 This is the second of three homes built by the Clarkson family on the hill campus where Clarkson University now stands. 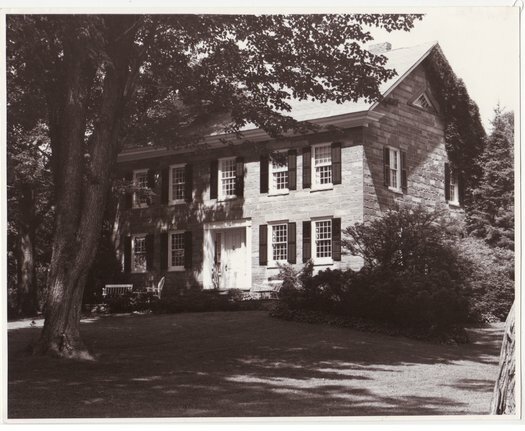 Constructed of slab-and-binder sandstone, an addition was built c.1840. 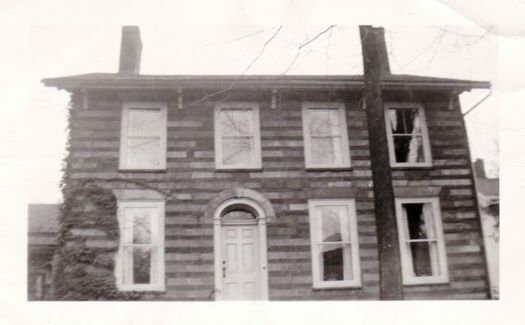 The home stood empty for years after 1855. The Clarkson sisters had it refurbished before 1909. DESCRIPTION: This Federal style house, constructed in the slab and binder method features a hipped roof and a fanlight above the front door. The compatible slab and binder rear addition was added in 1840. The house was added to the National Register in 2003. DESCRIPTION: First floor built using coursed rectangular blocks (front), sides and back random laid stone, and second story front addition is constructed in the slab and binder method.The front entrance shows more recent modernization. DESCRIPTION: Federal Style residence constructed of Potsdam Sandstone. The most distinct feature of this building is its unusual slab-and-binder method of construction, in which the stone is laid so the grain direction alternates with each course. The house includes an original fireplace with a beehive oven, ash pit and original crane and hooks. In 2003 it was added to the National Register of Historic Places. DESCRIPTION: Possibly constructed by George Train and/or David Mathews, using slab-and-binder method, and Commissioned by Judge Horace Allen. Harriet S. Allen (daughter of Horace Allen) married William A. Dart in 1814. 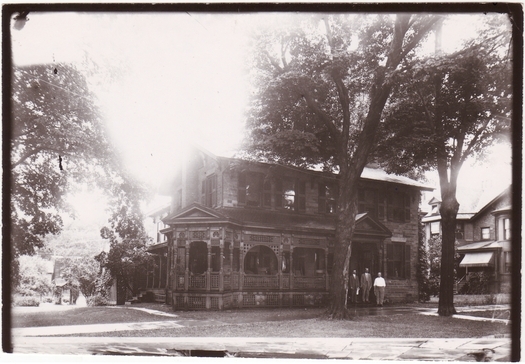 The Dart family lived in the house until it was sold to the Knights of Columbus in 1932. DESCRIPTION: Constructed by George Train using slab-and-binder method. 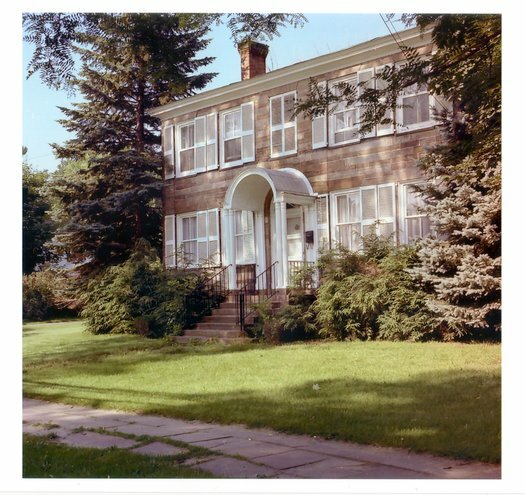 DESCRIPTION: The house of slab-and-binder sandstone construction was possibly built for John C. Clarkson, and used as a residence for Presbyterian ministers, c. 1831-1837. 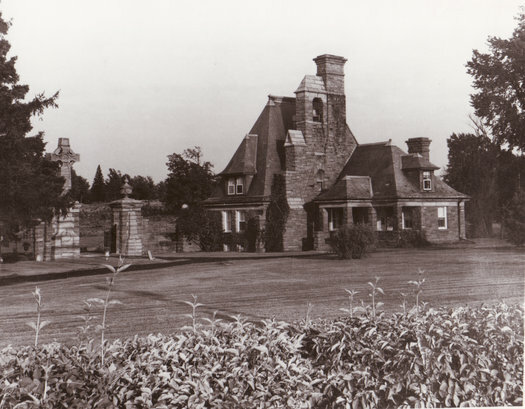 It was then purchased by lawyer Liberty Knowles, and remained in the Knowles family until 1873. It was restored in the 1980's, and in 1995 it was listed on the National Register of Historic Places. DESCRIPTION: The house was built with coursed stone front and sides, the back of the house constructed using random laid stone. 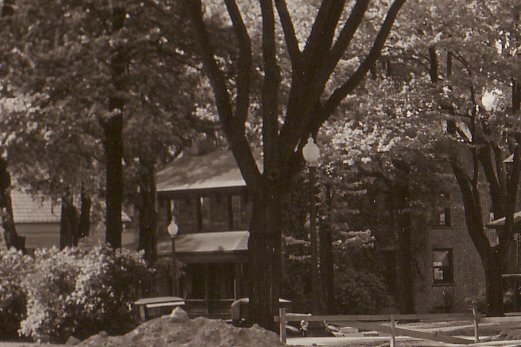 The Lockwood family added the cobblestone porch in the early 1900's. 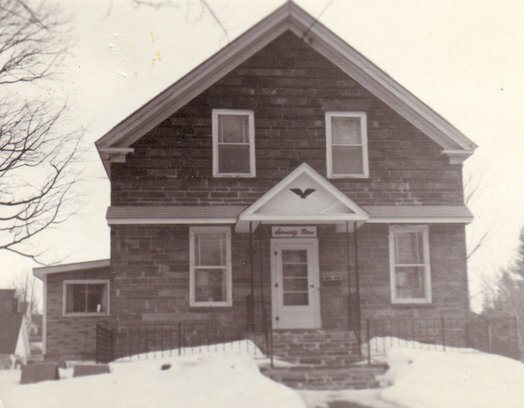 Alpha Delta sorority purchased the house in 1933. 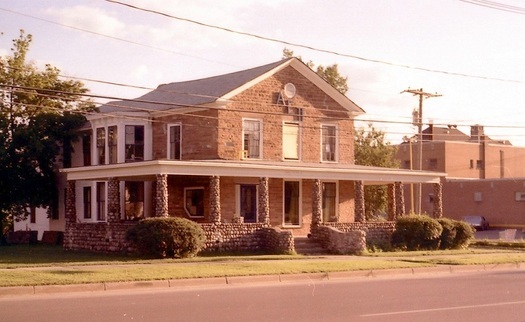 Alpha Epsilon Pi Fraternity purchased it in 1969. The building was demolished in 1998. DESCRIPTION: Another example of early slab-and-binder construction. 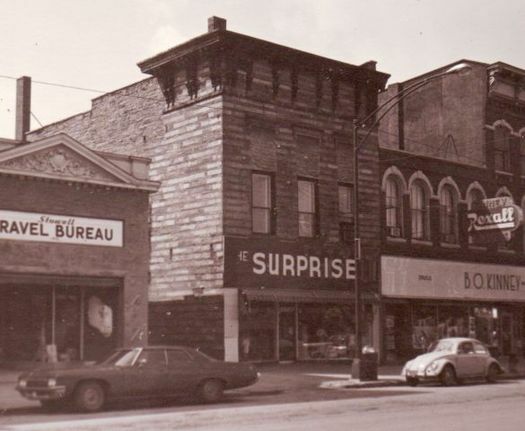 When this photograph was taken, the business occupying the building was "The Surprise". Today it houses a clothing store named "The Isle of You". 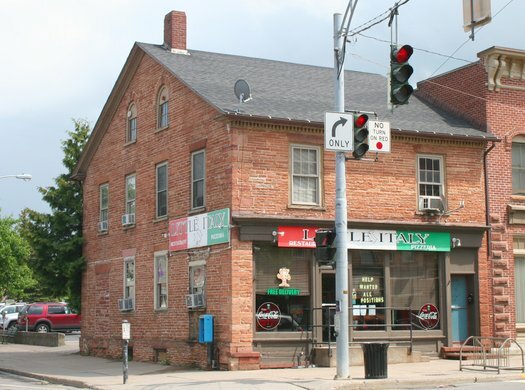 DESCRIPTION: One of the most elegant of the early slab-and-binder sandstone houses, this was the center of the Clarkson farm that stretched from Market Street to Elm Street and north to the village border. 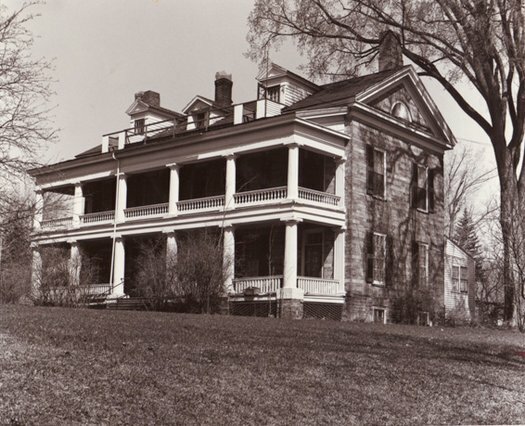 Purchased by General Edwin A. Merritt c.1860, the house remained in the Merritt family until 1937, through General Merritt's granddaughter, Esther Merritt Sisson. DESCRIPTION: The original church was constructed in the slab-and-binder method. 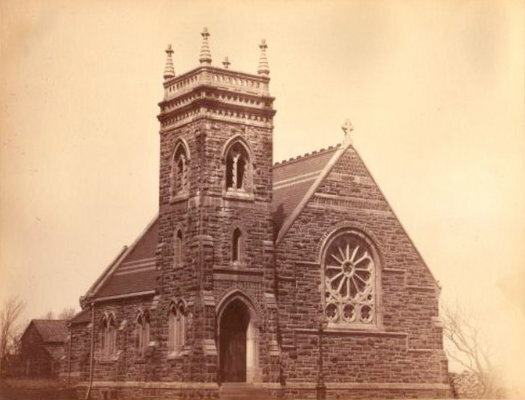 The facade and chapel were built in the rough ashlar method with the sandstone donated by the Clarkson family in the 1880's. 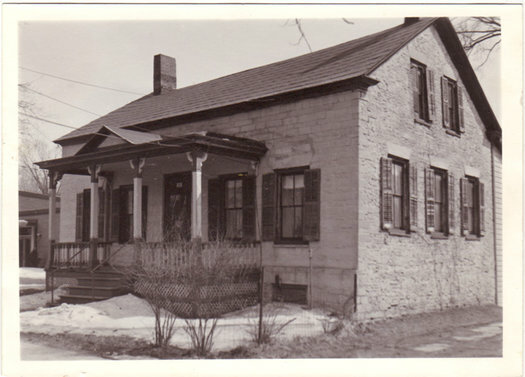 DESCRIPTION: This sandstone house was built by Aaron T. Hopkins, who operated a tannery at One Market Street. The porch and third story dormer date from 1890 and 1945. It is now Zeta Gamma Sigma sorority. DESCRIPTION: Federal Style architecture, built with the slab and binder method of construction. Added to the National Register in 1985. DESCRIPTION:Built across the road form the Nathaniel Parmeter Sr. House with stone form the Parmeter's quarry. Has a hog house built of sandstone on the property. The house is slab and binder method of construction and the hog house is random laid stone. DESCRIPTION: Built of slab-and-binder sandstone with Italianate brackets. 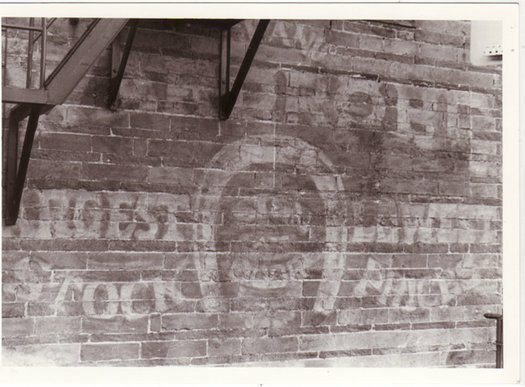 Originally the Hopkins Tannery and Leather Shop, it still bears evidence of an advertisement for the "Grand Wardrobe" on the south side. 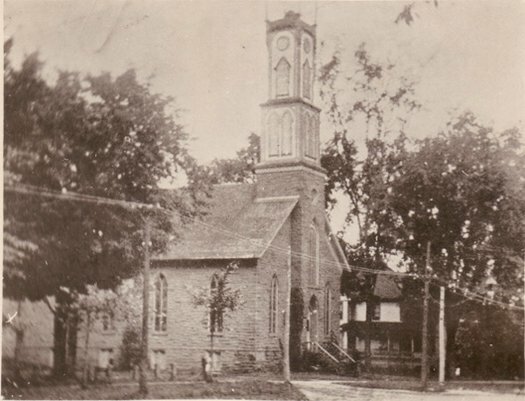 DESCRIPTION: The Presbyterian Church, the parish of which was first organized in Potsdam in 1811, was built of sandstone in the rough ashlar method. The Presbyterian Center was added in 1970. 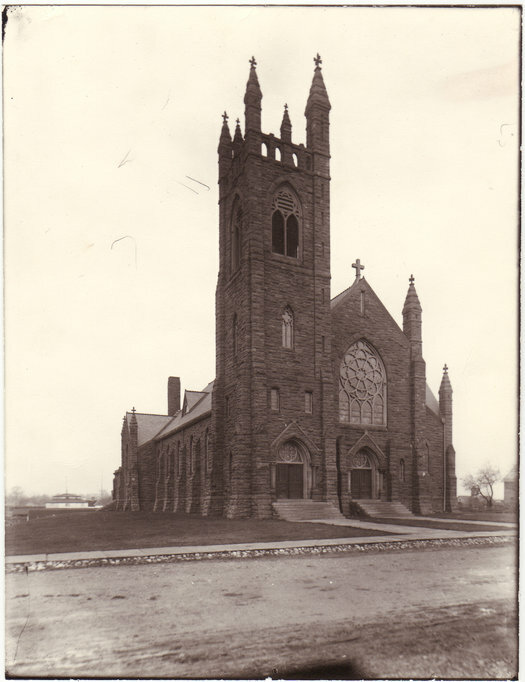 DESCRIPTION: Romanesque Revival. The Water Works are also part of the Market Street Historical District. The original part of the building is a good example of sandstone construction the rough ashlar manner, and features rounded window arches typical of its style. 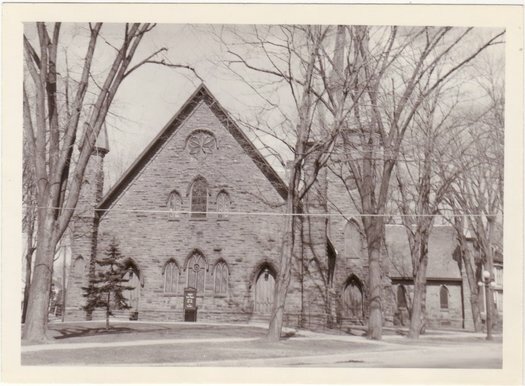 DESCRIPTION: The Universalist church was constructed using rough ashlar sandstone from the local quarries in 1876, and now is the site of the Potsdam Museum. DESCRIPTION: The sandstone construction method is rough ashlar. 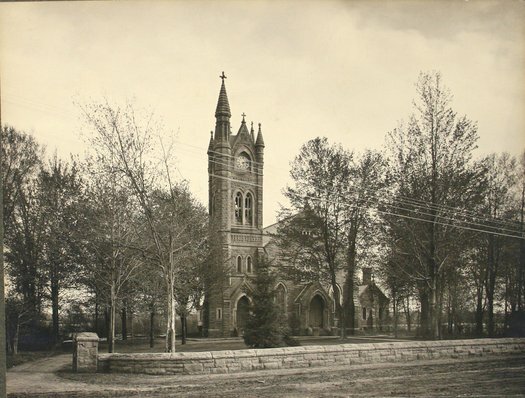 The church was errected in loving memory of Elizabeth Clarkson, the wife of Thomas S. Clarkson II, and mother of Thomas S. for whom Clarkson University is named. DESCRIPTION: Romanesque Revival architecture. One the few rough ashlar commercial buildings, built by quarry owner Charles Cox. The year of construction is carved on the facade. 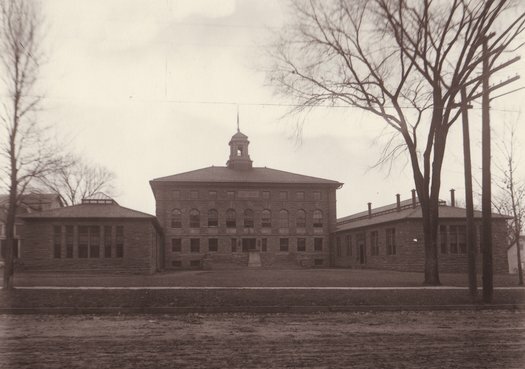 DESCRIPTION: The first building erected to house classes for the Thomas S. Clarkson Memorial School of Technology founded by three of Thomas' surviving sisters following his tragic death in 1894. DESCRIPTION: Gothic Revival. The Roman Catholic Church is built of rough ashlar sandstone from the Clarkson quarries, and features a rose window in the facade. DESCRIPTION: Richardson Romanesque. Built of rough ashlar sandstone to hose a land office, this building was used for many years as offices for Trinity Episcopal Church (across the road). DESCRIPTION: The New York Central train station on Depot Street was built of Potsdam sandstone in the rough ashlar method. 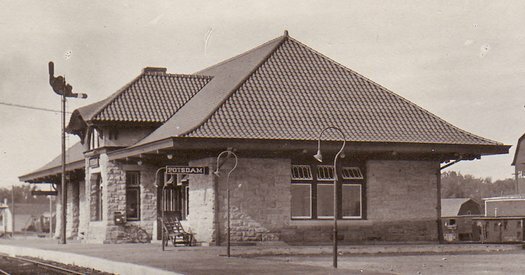 It was moved to its present site in 1980. DESCRIPTION: Neo-Classical Style. 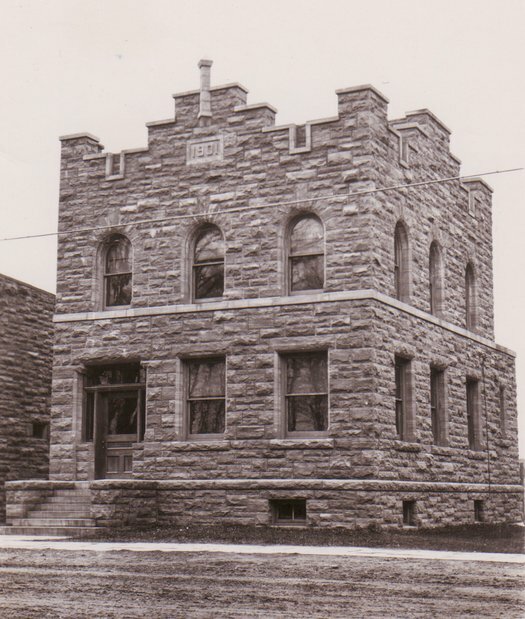 Snell Hall is another example of rough ashlar sandstone construction. 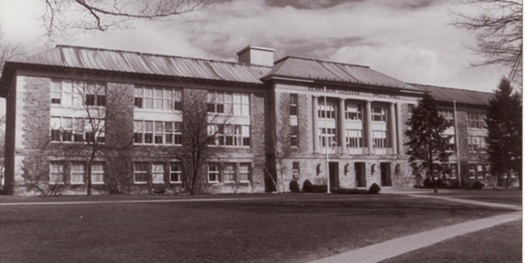 It originally housed the Potsdam Normal School, and was the Potsdam State Teachers College until 1958, when it was given to Clarkson College. It was renamed for U.S. Congressman Bertrand H. Snell. 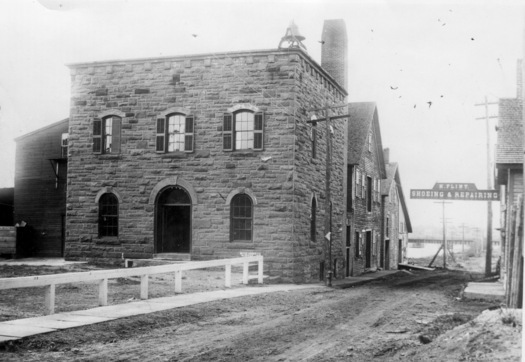 This was the site of the St. Lawrence Academy (1825-68) and the first Normal School (1868-1918). DESCRIPTION: Dutch Colonial. 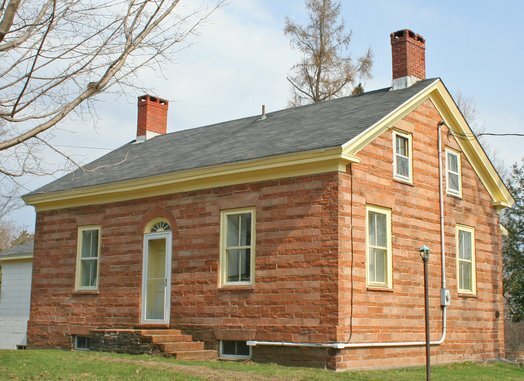 This is the only house in Potsdam built in the rough ashlar style of sandstone construction. The builder was Frank Ditano. 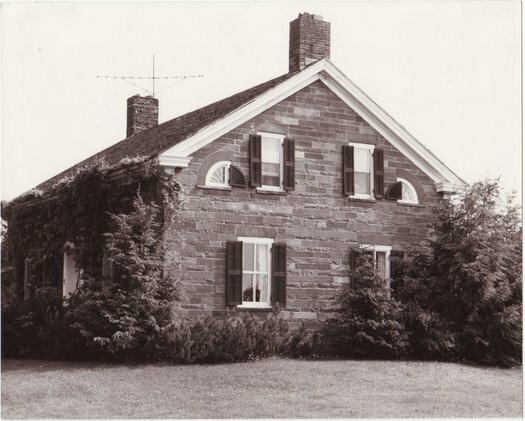 Several local citizens concur that the stone came from a demolished house across from the quarries on the Back Hannawa Road (County Route 59.) The stone would have been re-cut to add the ashlar facing. 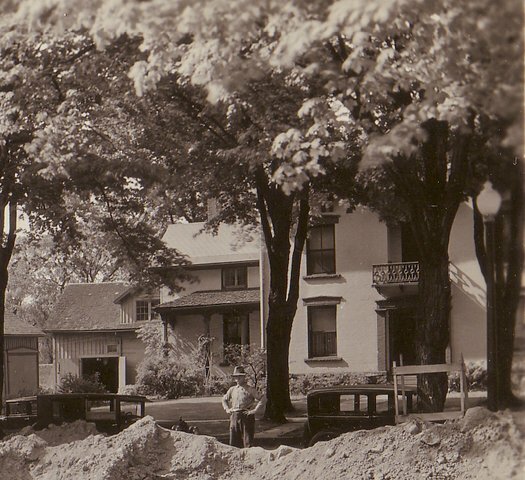 IN 1932 the new Potsdam Post Office was under construction. This view was taken from the back of the Methodist Church looking north. 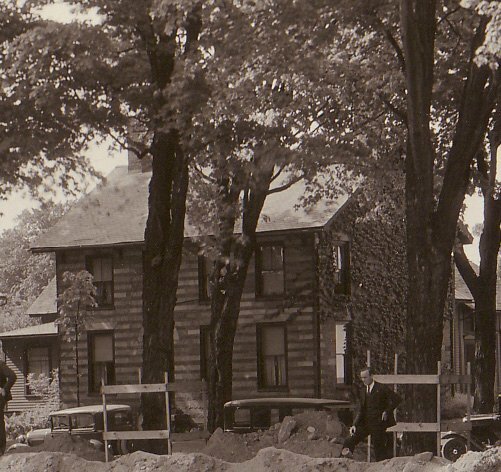 Captured in this photograph are 3 sandstone homes. 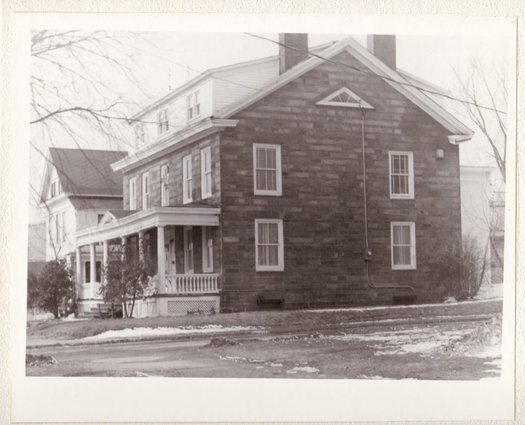 On the far right of the photo is 16 Elm Street, "The Pert House" built of brick and painted white. 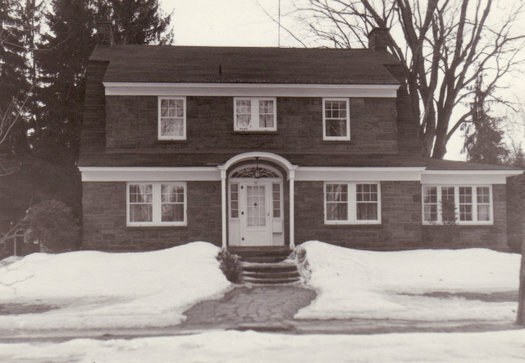 The house to the left of it is 14 Elm Street, where the HSBC bank now stands and the next house to the left is 12 Elm Street. 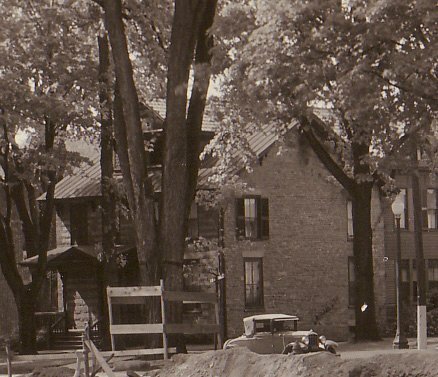 Both these houses were razed to build modern commercial buildings. At the far left - 10 Elm Street - is the "John Call House" built in 1823. 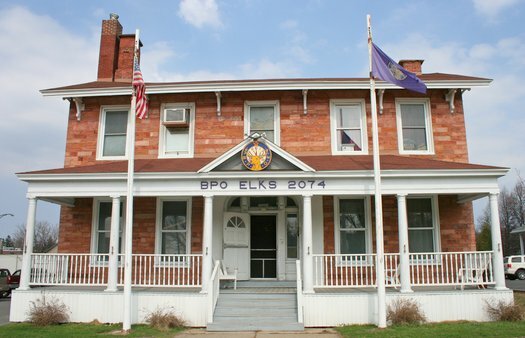 It is now (2011) the Elks Club of Potsdam.